We called him, “Benj.’ The villagers used to call him, ‘Benjari,’ which sounds similar to the name of a fish, “jari,’ very common in the Jeju Island. It was Miryang, a village woman, who put him with such nickname. A villager poet, Kim Sung-Gyu wrote a poem for ‘Benjari,’ from the intimate feeling toward him. Benjamin Monnet, a French peace maker, as we often miss him now, has been our close friend. Despite the different language, he loves Gangjeong, Gureombi, and prays for the peace and lives of the Jeju. He first came to Gangjeong upon the moment of Women’s film festival in May, 2011. 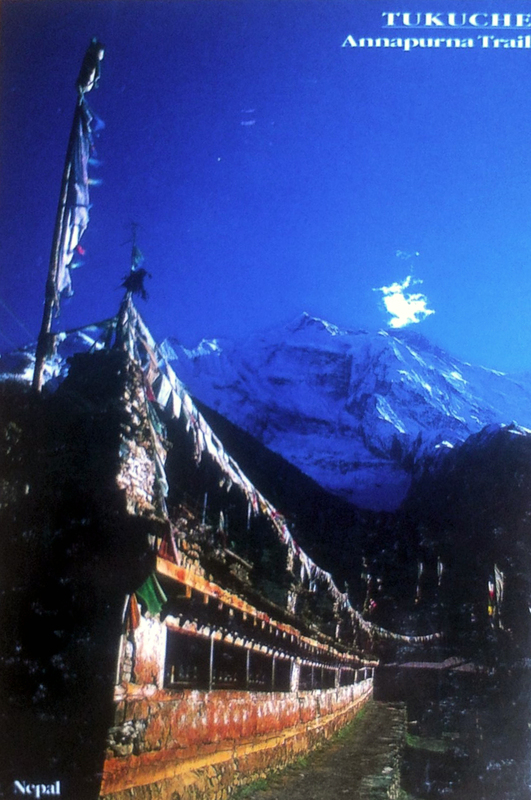 Since then, Gangjeong became a kind of his spiritual hometown. 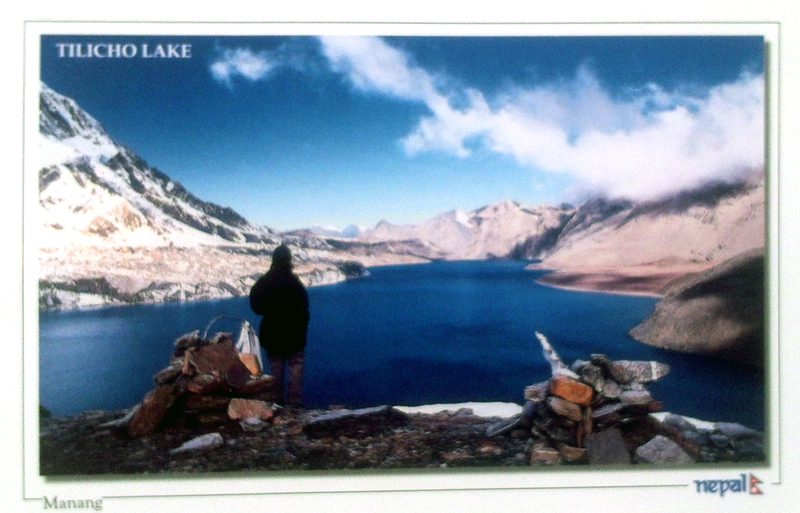 Thanks to Seri who recently visited him, we could get his postcards to the Gangjeong Village international team, villagers and Prof. Yang Yoon-Mo. We share those here. 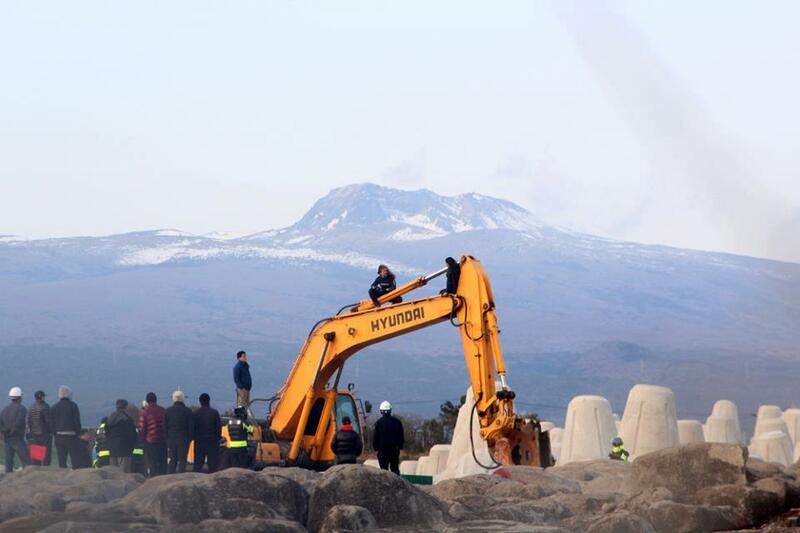 On March 12, Benj and Seri stopped the destruction of the Gureombi Rock for two hours in suim suits in cold weather. The beautiful site that they tried to keep has now become the ugly 3~4000 ton caisson production area. 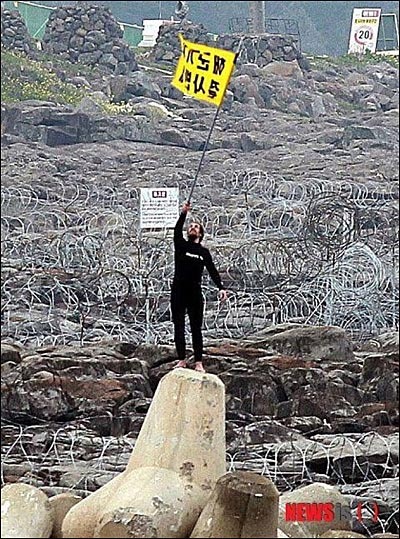 The navy eventually blasted the 10 % of the Gureombi Rock in the east and west parts of it during March and April last year. And It started to produce caissons for 24 hours since Oct. 25, 2012. However, we will restore the Gureombi Rock unless our hearts and determination disappear. 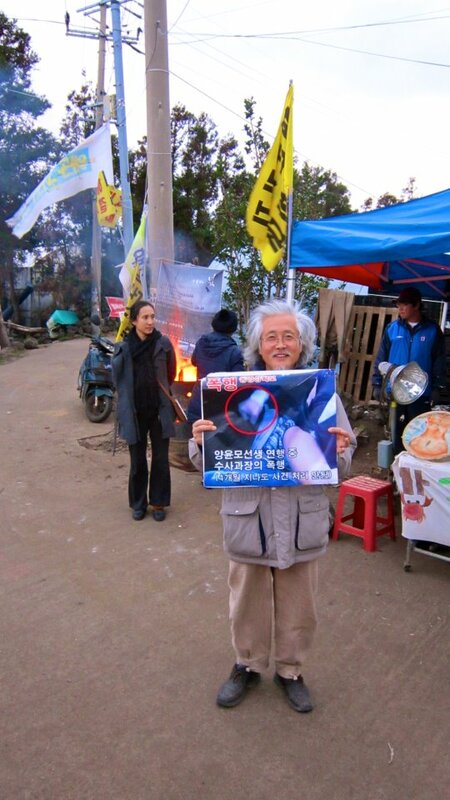 His message shows his continuous heart for the Gangjeong and Gureombi Rock. We thank and miss him, our brother! Thanks to Seri, I have well received all your gifts. I truly appreciate it. So please receive some hand-made embroidered t-shirt of my creation. I was thinking to put them on website, Peace Center for the people to buy it. The proceedings of the sales could help to strengthen the movement or pay the court fines. What do you think? 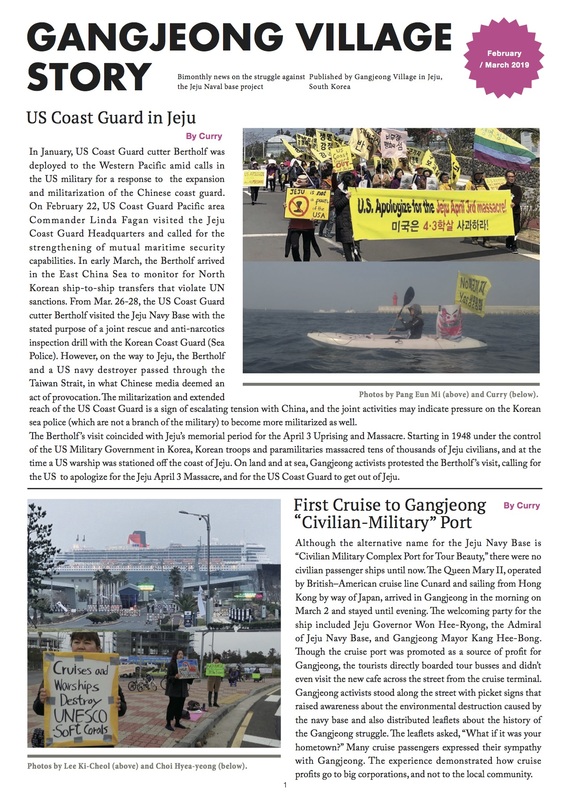 We can also sew a Korean version…I am searching for new ways to help Gangjeong. 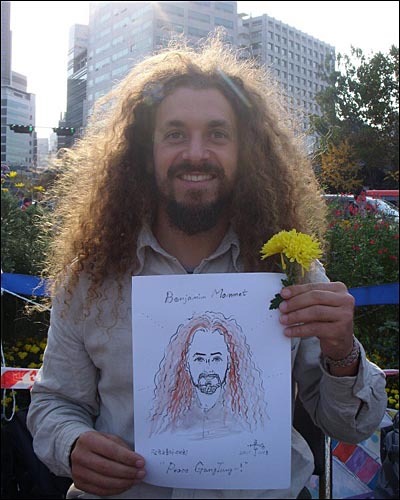 I am in contact with two French journalists who are ready to make a documentary about Gangjeong situation. I ignore where you are, But I heard you were surprisingly sentenced to jail for 18 months. 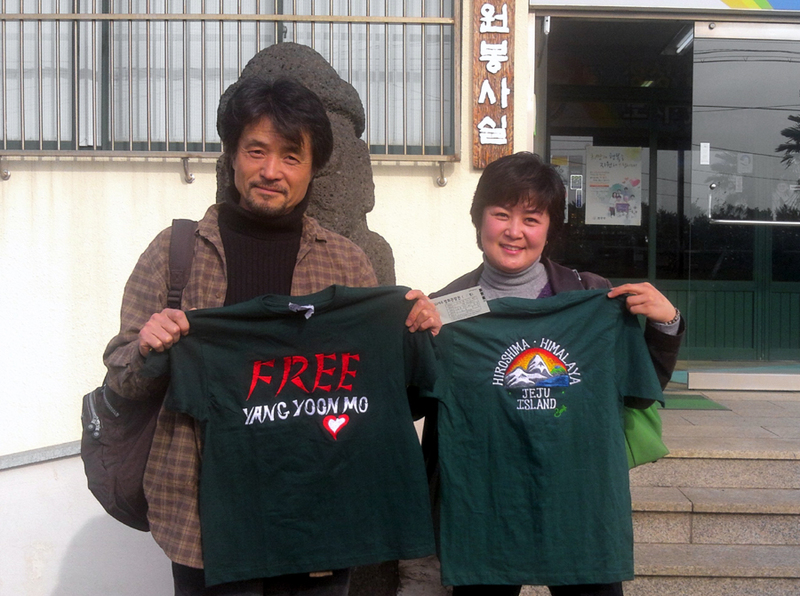 I sent some t-shirts to Gangjeong with “Free Yang Yoon-Mo ♡“ embroidery. Hoping the people will buy it in solidarity with our resistance movement. I remember when we were in the cell together, at Dongbu in March 2012. You were practicing some kind of meditation. As a meditator, I wish that inner-insight practices, will help you to pass sense fully through the term of your sentence-Concentrating on your breathing and observing your inner sensation to purify your mind. You will come out stronger. “The struggle for Harmony continues. 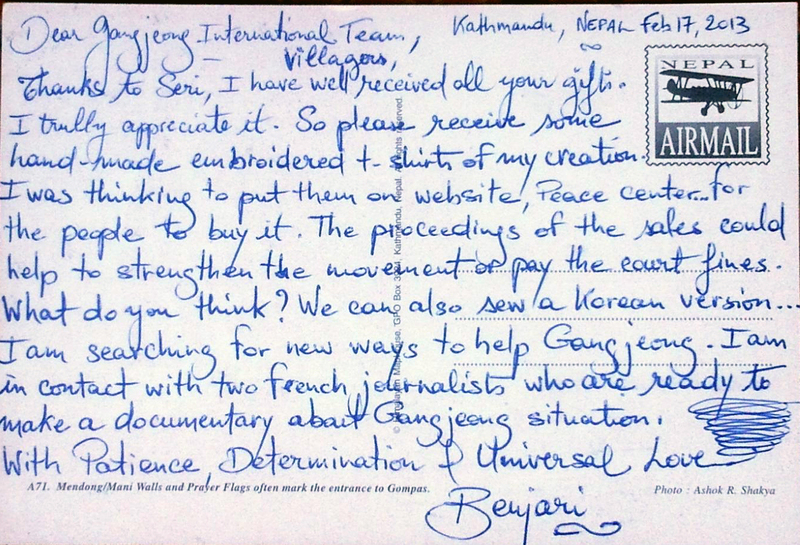 The front side of t-shirt sent to mayor Kang Dong-Kyun. 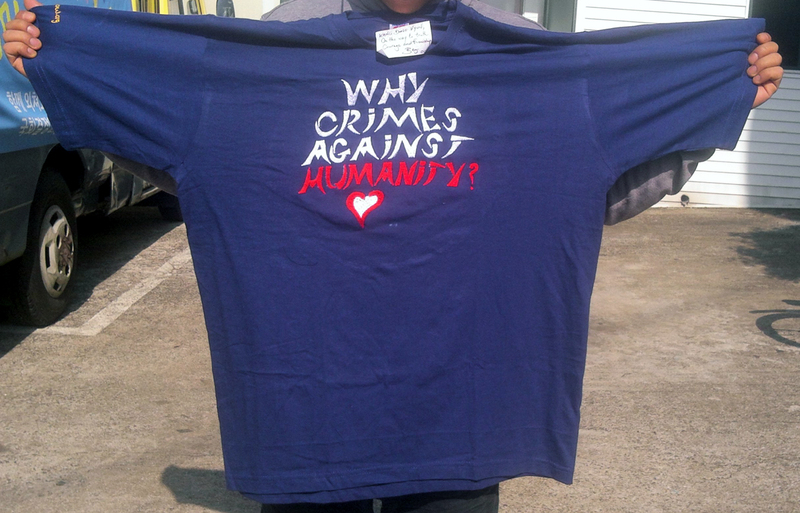 While the front is of the embroidary letters of “Why Crimes Against Humanity?,” the letters of ‘savejejunow.org’ is described at the end of a sleeve. One green T-shirt is of the embroidary letters of ‘Free Yang Yoon-Mo.’ Benj designed himself and asked embroidaries. As seen in the below photos, T-shirts for women are green while the T-shirts for men are blue and black. 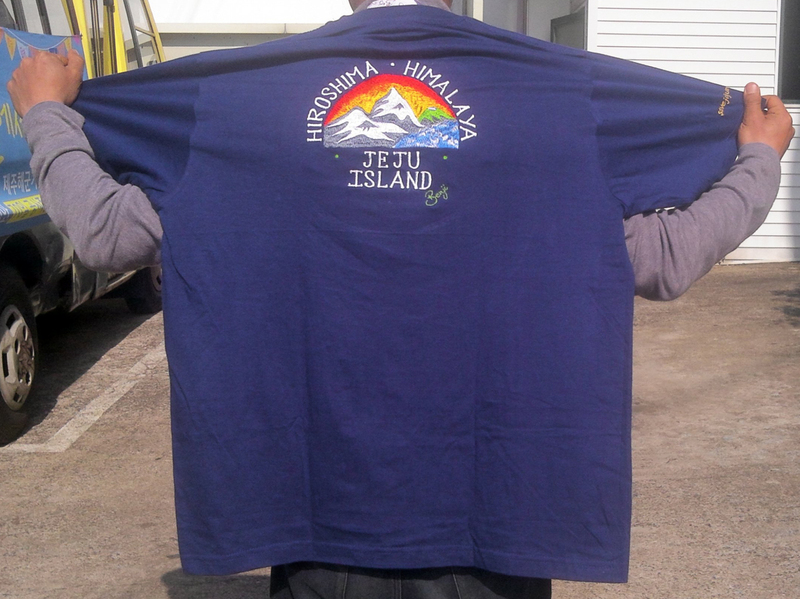 The back side of T-shirt is the embroidary letter of “Jeju Island, Hiroshima, Himalaya.” In the right bottom of the image, it is signed in embroidary of ‘Benj’. 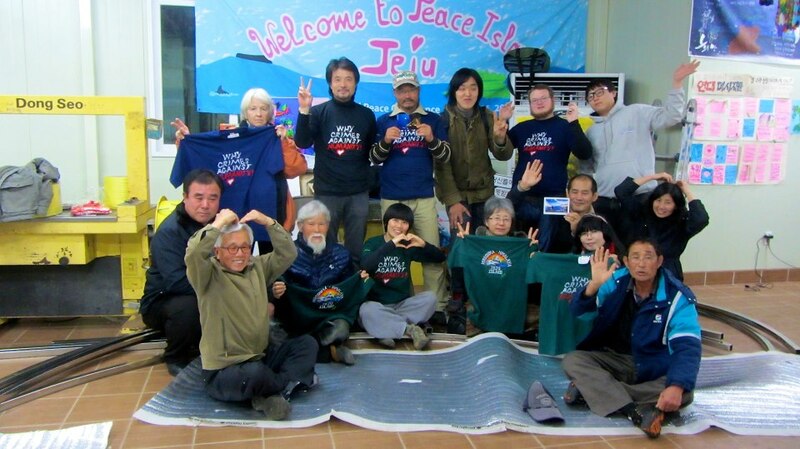 Photo by the Village International team/ On Feb. 28, Mr. Koh Gilchun, Jeju artist, and Oh Soon-Hee (Sister of the ‘Jiseul‘ movie director, Oh Myul ) Visited Yang-Yoon-Mo and showed him his t-shirts to the delight of Yang Yoon-Mo. 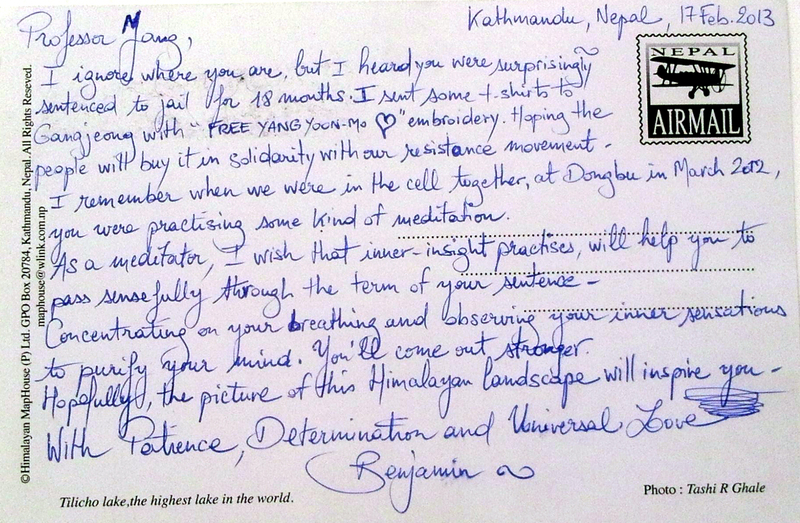 Benj’s postcard to Prof. Yang was also delivered to him on the day. 5. Benj is always with us.